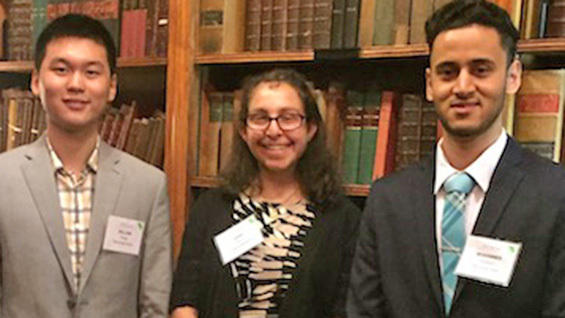 Civil Engineering students William Yang CE'19, Mohammed Hossain CE'19, and April Mintz CE'19 are scholarship recipients. William Yang was awarded the Loring Consulting Engineers, Inc. Scholarship Award for the 2018-2019 year. Mohammed Hossain was awarded the Sam Schwartz Engineering Scholarship Award from the ACEC New York Scholarship Fund. April Mintz won a scholarship from the ACEC New York Scholarship Fund awarded to "about 20 undergraduate students intending to become consulting engineers majoring in Mehcanical Engineering, Electrical Engineering, Structural Engineering, Civil Engineering, Environmental Engineering, Chemical Engineering, Engineering Technology or Surveying." More information about the ACEC New York Scholarship Fund can be found here. April Mintz was also awarded the ASCE Metropolitan Student Scholarship for students who are ASCE members majoring in Civil Engineering, Civil Engineering Technology or Construction Management. More information about ASCE scholarships can be found here.